THE GUNTHER GANG: Pumpkin Nights. 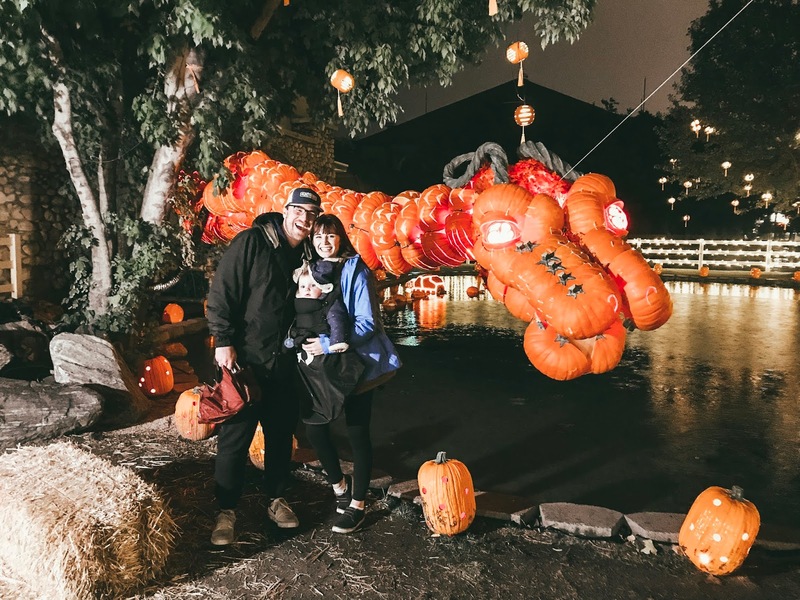 We went to Pumpkin Nights up at the Utah State Fair Grounds this week! We went on one of the "worst" nights because it ended up raining the entire time we were there BUT that's what made it so magical! 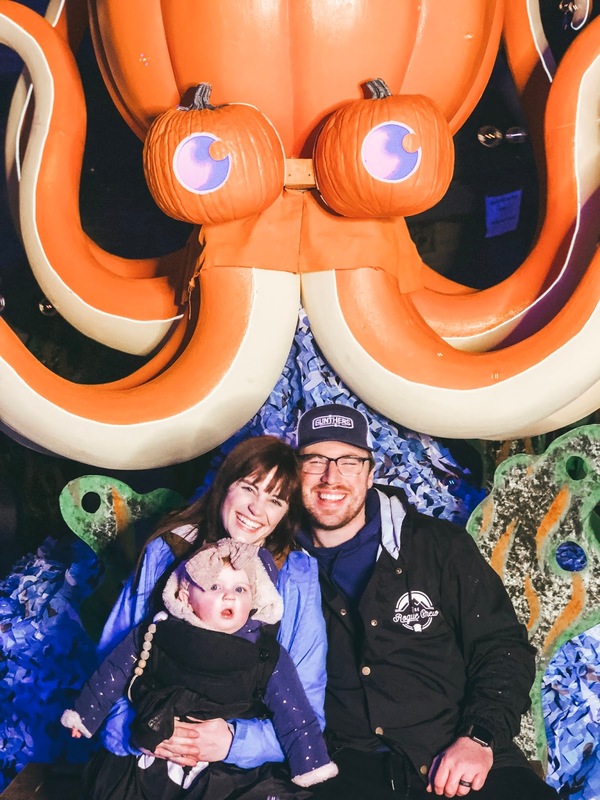 We were a little worried about how it would all go down with the rain and a baby (especially because we kept her up long past her regular bed time) but we were pleasantly surprised by our experience! I've been seeing advertisements for Pumpkin Nights for a few years now (aka I've been wanting to check it out for a while). 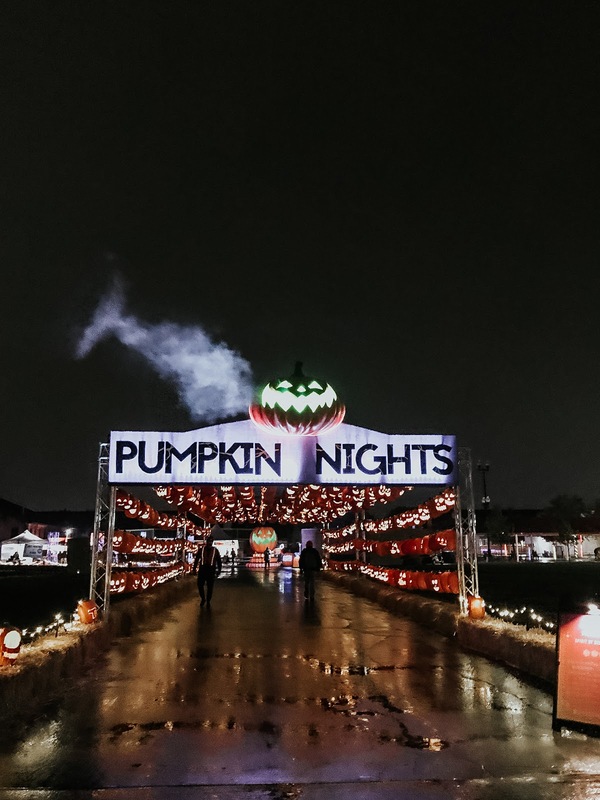 It was so fun to find myself finally walking up to the pumpkin-covered walkway while the Harry Potter soundtrack played somewhere off in the distance. There aren't many better combinations than Harry Potter and pumpkins, if you ask me. 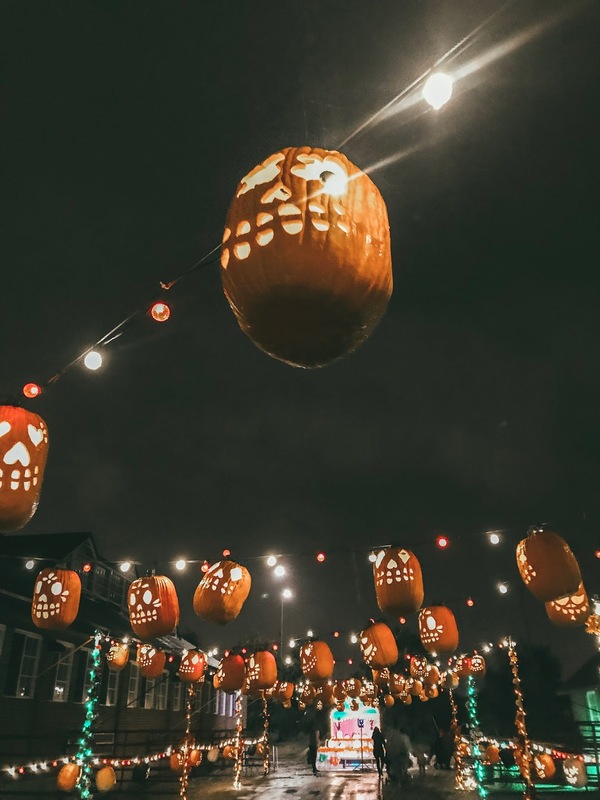 It was extra cool to see all the lights illuminating the jack-o'-lantern faces and reflecting off the wet pavement. 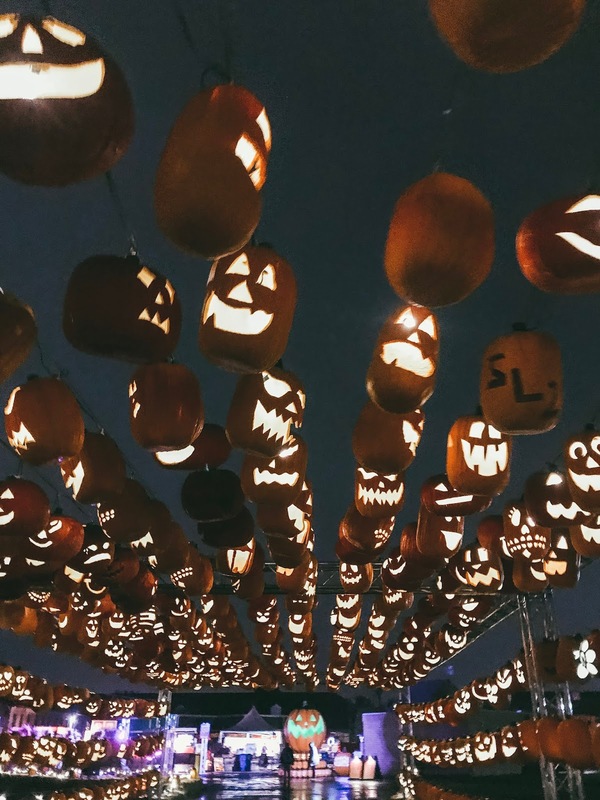 A slight breeze caused all the pumpkins hanging overhead to sway to the music. It was all so perfect. 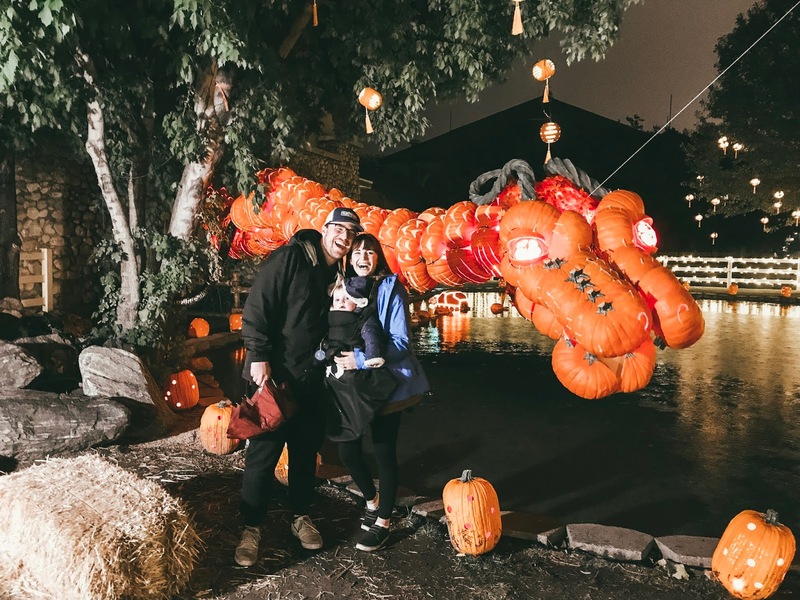 When we walked past this particular pumpkin, I made Taylor stop and stand next to it so I could get a photo of him next to the "Taylor pumpkin" hahaha. For some reason it made me think of him and I wanted to remember how silly that thought was. 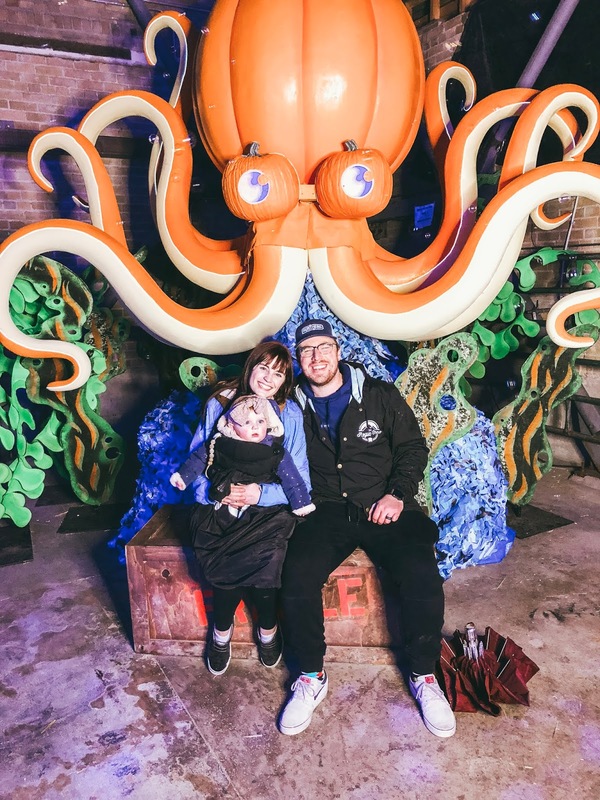 There was a whole collection of themed sections in which they used pumpkins to make up all of the cool statues and scenery. This one was cool because it took me back to my asian roots (insert winking emoji here because we all know I wish I was actually asian and not just asian at heart haha). 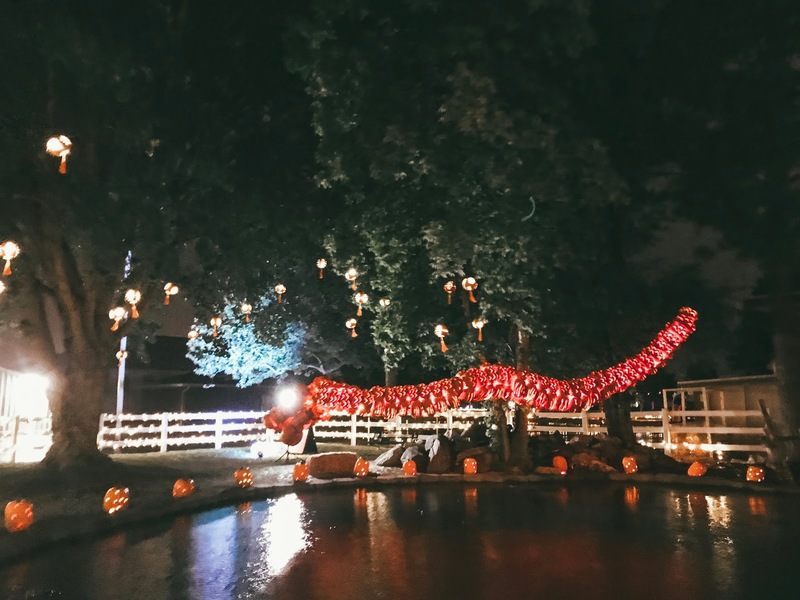 They created a full-blown dragon that hung suspended in the air and would occasionally blow out big puffs of smoke. We were all so impressed (although, I didn't get any pictures of it blowing out smoke, unfortunately). 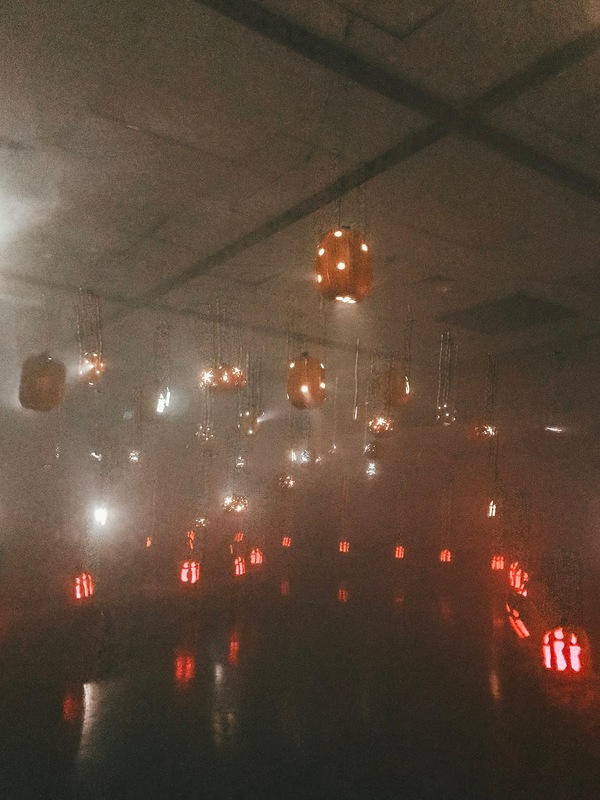 We walked through foggy rooms, bubbly rooms, day-of-the-dead-themed rooms, YOU NAME IT. 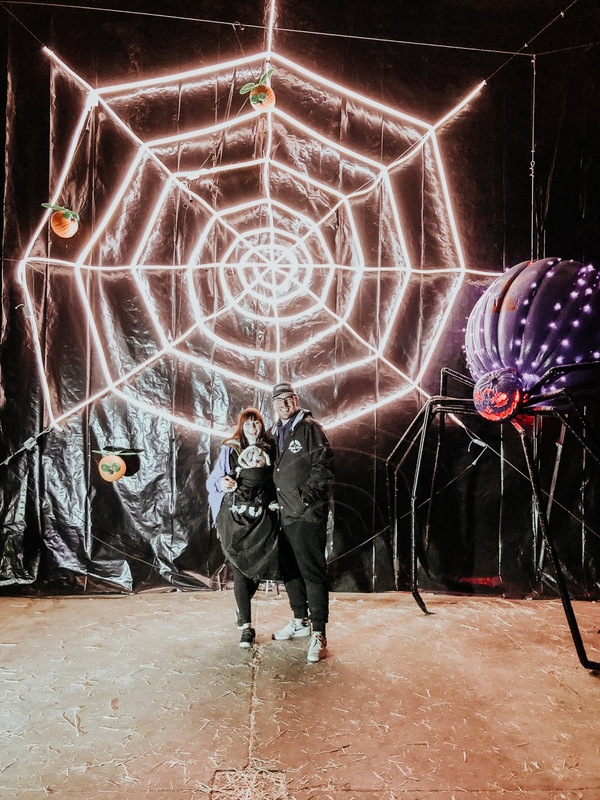 It was so cool to see how someone was creative enough to come up with that many themed rooms around PUMPKINS. I was in absolute awe the entire time, I'm not going to lie. We walked out of one of the rooms and spotted this man holding an OWL. I've never been that close to a real owl and it blew my mind. It's such a beautiful animal. 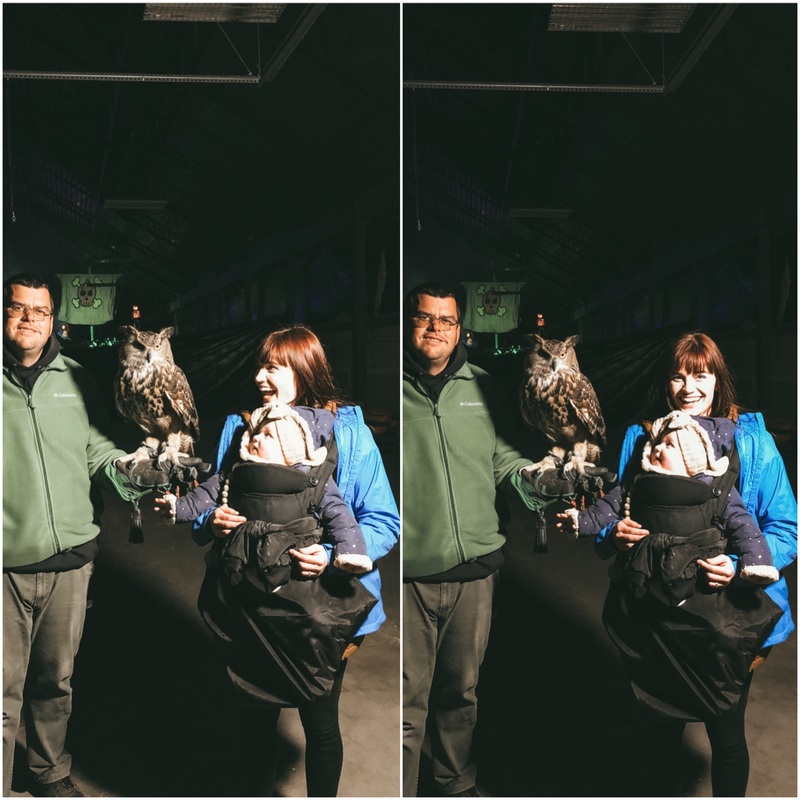 Billie was very intrigued but timid at first-- it took her a second, but she eventually got very excited about being so close to an owl! There were also a couple of crows perched upon a donation box and, when I held out a dollar for them, they snatched it up with their beaks and then transferred the money to their feet, where they were then able to drop it into their donation box. Tay kept on saying, "That was the coolest part of the WHOLE night," over and over again. It was pretty dang cool, though. 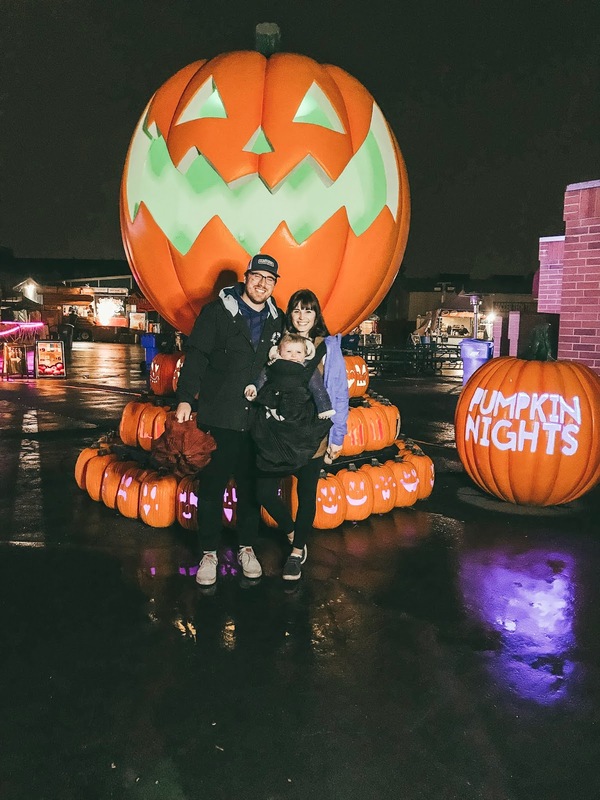 We'd totally recommend Pumpkin Nights-- especially to people with young children. BUT, it's fun for everyone, if you ask me! I got some very good pumpkin carving inspiration, that's for sure. 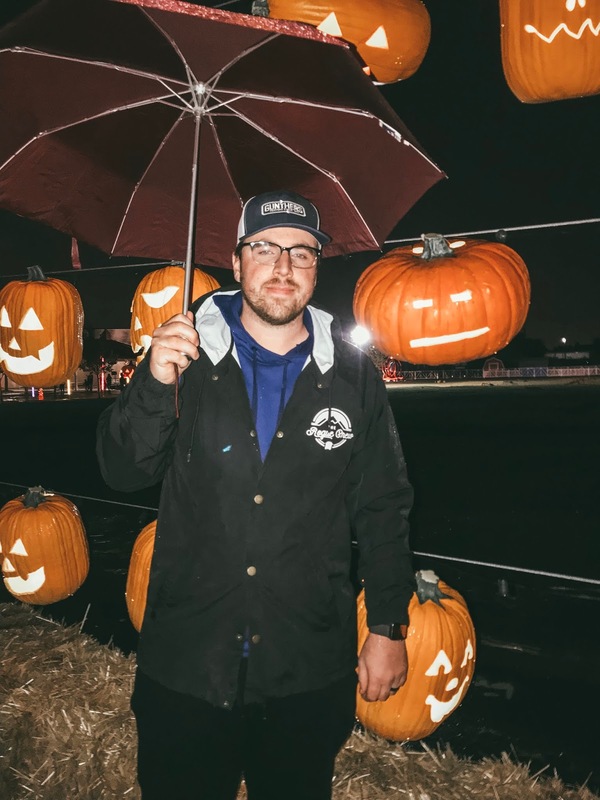 Let's see if I can actually pull off all the cool ideas I got from all of the pumpkins we got to see!